The USTA recently announced that the Surprise Tennis and Racquet Complex in Surprise will host a Tennis Block Party on Saturday, January 31 as part of a week-long series of events leading up to the Fed Cup quarterfinal tie between the United States and Argentina. Hosted at the site of the quarterfinal tie - the award-winning Surprise Tennis & Racquet Complex, the Tennis Block Party will feature a variety of intertactive games and attractions, and tennis instruction by skilled teaching professionals from the Phoenix metropolitan area, with the emphasis of the event on fun, family, fitness and supporting the United States Fed Cup team, which will play the following weekend, Feb. 7-8. • QuickStart activities for kids and adults. Try the USTA’s QuickStart initiative which features smaller courts and size appropriate equipment to help newcomers learn the game of tennis. • Fast Serve/Guess Your Serve contest. Have you ever wondered how fast your serve speed is? Here’s your chance to have it recorded, and to compete against other talented servers. Or, if that’s not your thing, be the closest to guess the speed of your serve. • Cardio Tennis Courts. Run through a fast-paced court with the emphasis on working up a good sweat while learning new tennis skills. • Drill Courts. Utilize tennis drills and activities to hone your skills and get a good workout. • Beat the Pro. Here’s your chance to show what your game is made of, playing doubles matches against some of the top players and teaching pros. • Tennis Ball Art. Attendees will have the opportunity to paint balls which will be put on display during Fed Cup weekend. • Vendor Courts. Special demo courts from racquet vendors will let you try out the latest and greatest equipment. • Face Painting and Interactive Games. Participants will also have plenty of chances to win prizes on court at the event. 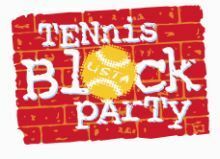 Additionally, just for participating at the Tennis Block Party, participants will be entered in a raffle for a chance to win one of five pairs of tickets for the Federation Cup match between the <?xml:namespace prefix = st1 ns = "urn:schemas-microsoft-com:office:smarttags" />United States and Argentina on Feb. 7-8. To learn more about Federation Cup or to purchase tickets for the matches on Feb. 7-8, click HERE. USTA Southwest needs	volunteer for the Tennis Block Party on Jan.31	and for the week of Fed Cup and match days. Please	e-mail volunteer@southwest.usta.com with your	name and contact information to find out how you can help be a part of this international event!